Has Salmond slipped up on Scotland’s oil? You wait all day for a government to show up, then two come along at once. Residents of Aberdeen were left tripping over politicians today as David Cameron and Alex Salmond held rival cabinet meetings within a few miles of each other. Europe’s offshore oil boom town was the obvious stage for the latest ding-dong in the independence battle. Mr Cameron wants to convince Scots that only the UK has the economic muscle to get the most out of the UK’s oil and gas reserves. For Scotland’s first minister, hydrocarbons are the bedrock upon which an independent Scotland’s economic future will be built. There’s a huge amount at stake. What is Mr Salmond saying about Scotland’s oil wealth? This is a favourite claim among campaigners who want Scots to vote for independence in the referendum on 18 September this year. It’s based on gross domestic product (GDP) per capita, and assumes that Scotland will get a geographic share of the UK’s oil and gas fields. This was the top 10 based on 2011 data from OECD countries, according to the Scottish government. Note that most of the world’s wealthiest countries are either geographically small, or have small populations, or both. Bigger isn’t necessarily better. We think the maths is right, but there are two conceptual problems with trying to claim that Scotland belongs in the top 10. The yes campaign tends to allocate a geographic share of North Sea oil and gas as though Scotland will automatically assume control of all the hydrocarbons that lie inside Scottish waters, as defined by the “median line” boundary used to demarcate fishing zones. Most of the experts we have spoken to do think it likely that this is the methodology that would be used to carve up oil and gas, giving Scotland 90-odd per cent of it – but nothing is set in stone. Like most of the big economic questions including national debt and currency, this would be up for negotiation in the event of a yes vote. Some economists question the use of GDP per capita as the best indicator of wealth in this scenario. It’s not an unusual measure, but the University of Glasgow’s Centre for Public Policy for Regions argues that it downplays the extent to which North Sea activity is foreign-owned, with the profits flowing overseas. Gross national income would arguably be a better measure, as it would cover production by businesses actually owned by Scottish citizens – but the figures don’t exist. True. Just because oil is at the centre of the debate today, let’s not assume that Scotland would be lost without it. Leave the North Sea out of the equation completely, and Scotland is only very slightly less prosperous than the rest of the UK. This is true on a number of different measures of wealth, as our University of Glasgow academics have also summarised. This £1.5 trillion figure has been around for a while and comprehensively attacked by many critics including the Treasury in Westminster. The nationalists appear to get to that number by multiplying the most optimistic assessment of how many barrels of oil and gas are left in the North Sea – by the price of $100 per barrel. You then convert that into pounds and hope the exchange rate holds up. In a report last year, the industry group Oil and Gas UK estimated that there are still 15 to 24 billion barrels of oil and gas in the North Sea. Sir Ian Wood’s review of the North Sea industry today takes 12 billion barrels as the likely low extreme and, again, 24 billion barrels as the high. As far as future oil prices go, anything could happen. The IMF, World Bank, and Economist Intelligence Unit all forecast that prices will fall below $100 a barrel in the long term. Others including the Department of Energy and Climate Change think they will be higher. Worse, this parliamentary answer from SNP minister Fergus Ewing suggests that both oil and gas reserves have been multiplied by the predicted oil price, whereas natural gas trades at much lower prices. It also costs money to get the oil out of the sea bed. The UK government claims it would cost more than £1 trillion to extract the fossil fuel reserves claimed by the Scottish government. Independent estimates of the total cost of future North Sea production are hard to come by, but Sir Ian Wood finds that costs per barrel have gone up five-fold over the last decade. Efficiency is falling and the industry predicts that it will need substantial investment to get to the harder-to-find remaining reserves. 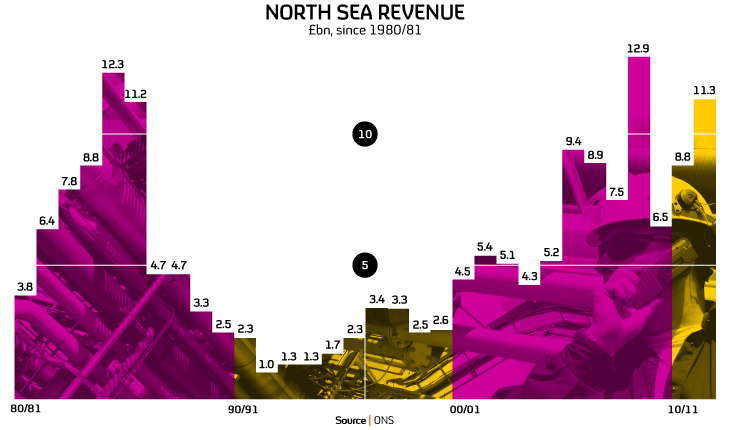 North Sea production has been falling since 1999 and price shocks mean that the amount of tax revenue the UK government has been able to collect each year has fluctuated wildly. So that figure of $1.5 trillion certainly doesn’t represent anything like the real future income from the North Sea. The Office for National Statistics says UK oil and gas is worth £120bn, £11bn lower than its previous estimate. Of course any figure the Scottish government comes up with for the future value of oil and gas will be subject to uncertainty. If its basic point is that there is a substantial amount of oil and gas left in the North Sea, they are right. Assuming a geographic share, Scotland has by far the biggest oil reserves in the EU. And uncertainty works both ways. What if oil prices soar for some reason? What if companies keep discovering new oil fields? Professor Alex Kemp, an academic much quoted by nationalists for his estimates of Scottish waters, sums up the situation like this: “Oil prices have been very volatile and this should remain the case over the next few years. “There has been dramatic cost escalation in all activities in the UK continental shelf, and a continuation of this will adversely affect taxable income. “Production has also fallen at a considerably faster pace than forecast only a few years ago and predicting future production is also subject to much uncertainty. In the mid-1990s, mindful of see-sawing oil prices, oil-rich Norway started to invest significant amounts of its offshore income into an investment fund, now worth £450bn. The Scottish government has praised this approach and contrasted it with the British approach of using the revenue to fund general government spending. Of course, like all savings plans, building up oil wealth for future generations would mean spending less in the short term, which might be painful or impossible. Economists have cast doubt on an independent Scotland’s ability to start paying into an oil fund without raising taxes or cutting spending, saying the books just don’t balance. Why? Does a report written nearly 40 years ago have any bearing on the situation today and in the future? So it OK to back Ukraine independence but not Scotland…WHY? Is it that you are just a puppet of Westminster? I am sorry,but the one thing absolutely,unequivocally 1000% not open to any sort of negotiation is Scottish territory.Any attempts by Westminster to annex part of Scotland to England would be reckless in the extreme. This is about North Sea oil but what about the oil fields being opened up off the west of the Hebrides? Professor Stieglitz, Nobel laureate in economics, when interviewed a year or so ago thought it was perfectly possible for Scotland to build up an oil fund even this late in the game. So take your pick. Yes there is enough – Oh no there’s not. really what you are saying is that England/RUK will not recognise the norms of International Law ?….these would be the normal Territorial Waters pertaining to any independent state , why do you assume that Scotland will accept any less ? I would suggest that you’re view is informed by the quaint notion that England somehow “owns” Scotland , that we might be punished or taught a lesson for wanting the same deal that sovereign countries the world over enjoy ….maybe your nice Mr Cameron is right and we really are too wee , too poor , and too stupid to exploit our own hydro carbon riches , maybe the best thing is to continue to let our neighbour share out our pay packet for us …you know ?. I am pro the union. Why? Independence is obviously beneficial for Scotland financially, now they have the largest multi million pound export whisky and salmon rearing business in the world, a very healthy tourist business in the summer, a huge tree replanting programme where timber is used to produce paper, cardboard, building materials, fencing and furniture, a snow skiing industry in the Cairngorms now developed to its peak after fifty years in being, a multi billion pound oil and gas industry offshore, a multi million pound drinking and tap water export industry, a unique beef, venison and lamb export industry, a huge tartan, shortbread, and sweet export industry, and the oldest and best educational universities and schools in Britain, they can give their population a good education, higher earnings and a lower tax threshold by becoming independent. In addition they will have an opportunity to develop their offshore fishing incomes, control unemployment, welfare outgoings, and all other government services for a lesser cost. They are not self sufficient in fresh produce and other foodstuffs and have to import most electronics, white goods, metals, motor vehicles and many luxury and miscellaneous goods but this is far outweighed by their potential income base. There are government statistics to prove the above, therefore their exit from the union shall be a great loss to the UK. Scotland is amongst the top 10 wealthiest countries based on 2011 data from OECD countries, according to the Scottish government. Note that most of the world’s wealthiest countries are either geographically small, or have small populations, or both. Bigger isn’t necessarily better. From the rest of the UKs point of view Scotland would simply become a trading partner much like any other country we deal with. There is resentment amongst the rest of the UK. After three hundred years of both sides taking benefit from our mutual relationship to build Scotland out of dire poverty hence the need for 25 million Scots to emigrate, many now want out. A very selfish move on their part. It would only be right for them to lose our mutual military protection and currency union. In addition, they, of course, must pay their fair share of the national debt. If they want to share the Queen then this should be via a commonwealth relationship only. A fixed border and Customs should be in place to vet their passports and keep the relationship at arms length and in addition to keep out undesirables.This of course would be beneficial to both sides and only fair under the circumstances. Independence should mean exactly that. Independence. Not the cherry picking of the better attributes that they are leaving behind that is currently the desire of the SNP leader Alex Hammond. Why is it selfish for us to want to use our wealth for the benefit of our own people rather than bankers and city types in the City Of London. If that is your view then why not go further and give the UK’s wealth to help poorer countries in Europe, given that you seem happy for everyone to share their wealth for the benefit of all….or does this concept only apply when it is Scots money going to England? RE “sharing” the Queen, does she know you plan to have a custody hearing? :-) A bit of a history lesson might help you here. She is Queen of Scots based on the 1603 Union Of The Crowns, which is not up for debate here, only the 1707 Union Of The Parliaments. You can not remove her as monarch of Scotland because it is not without the domain of England to make that decision. RE the border posts, these are illegal and unnecessary between two EU members, why would you want to keep your second biggest trading partner “at arms length”? Why would a land border between Scotland and England be more problematic than the current free trade land border between N. Ireland (UK) and Eire? And finally, this decision is for centuries to come and not about any one party or any one person…but if you are going to mention the guy who has been leader of Scotland now for 7 years then you could at least try to get his name right. You are so right – I agree with everything you say. The 1st and Deputy Scottish Ministers accused “Westminster Establishment Bullies” For the agreement on the pound not being shared. They accused the UK establishment of trying to bully the few million Scottish voters who will be voting in September. This is breathtaking arrogance. They forget that the Westminster establishment is answerable to a vastly more powerful electorate, the rest of the UK. We may not be voting in the independence vote. But we will be voting in the next General Election. Any party feeling like letting Scotland off “scot free” will not be voted in. 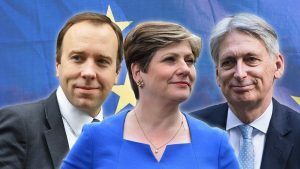 The UK silent majority WILL have its say. We careful what you wish for Scots. It is an accepted fact that every year for 30 years Scotland has generated more tax revenue per head for the UK treasury than the rest of the UK and also at exactly the same time for each of those years Scotland has recieved less back in its block grant from westminster than it generated in tax. By the mere fact that westminster have controlled scotlands purse strings we have but no choice to spend less in scotland than we generated in tax. Therefore in no shape or form has Scotland contributed the uks ever growing national debt, quit the opposite. figures taken from the Government Expenditure and revenue report Scotland (GERS) state that Scotland generated 9.9% of the UK’s tax revenue but received only 9.3% of spending. This equated last year to an amount of £824.00 extra revenue generated per person from Scotland versus the rest of the UK, all of which goes to the UK treasury and never comes back to scotland. Put simply, when the UK runs a surplus Scotland contributes more to the surplus, and when the UK runs a deficit Scotland has to pay more of the debt back than it is responsible for. Its a “lose/lose” situation for Scottish tax payers and especially for those in need of support from the state. So scotland is a rich nation in terms of revenue generation and gdp per head however as i described above we lose out because we subsidise the rUK . Whilst according to the Times,1 in 29 Londoners are dollar millionaires, 29% of Scots live in fuel poverty according to the latest research. In some areas in Scotland more than1 in 3 children grow up in poverty (1 in 5 across the nation as a whole). The charity ‘Child Poverty in Scotland’ says that with Scotland’s undoubted wealth, this statistic is a scandal. There is no reason why our child poverty rates should be so much higher than in many other European countries. In Denmark and Norway less than 10% of children live in poverty. According the UK Life Expectancy figures the impact of the unfair distribution of wealth under the Union combined with unemployment caused by deindustrialisation means that people who live in Scotland are dying earlier than those from the wealthiest parts of the UK. For example, the male life expectancy Scotland is 75 versus 79 in the English South East. Possibly more worryingly healthy life expectancy in Scotland is only 59.5. 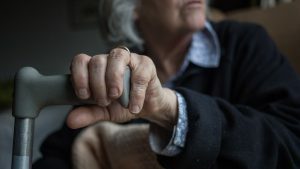 Because people are living far longer in the heavily populated South East, the state pension age is already due to increase to 67 by 2028 and future rises in the state pension age would remain linked to improvements in life expectancy. Asking your average Scottish man or woman to work seven years longer than his healthily life expectancy is asking a bit much. hope the shoulder is ok btw? The argument that all Scotland should have higher or earlier pensions than England due to lower mortality is spurious. Outside the Glasgow region mortality is virtually the same as rUK and it is possible as happens in private sector pension funding to allocate according to postcode. ” Alex Hammond” who is he? Never heard of him. Why was the Poll Tax given to Scotland, a whole year before England? Equal, Fair? Don’t think so! Now we have been given the Bedroom Tax by the London, English CON-DEM Coalition. The Scots don’t Vote Tory, only One MP in the London Parliament. Simply, they don’t represent Scotland or its people. Yet they impose cuts on the poorest with the lowest life expectancy of anywhere in the Union. The Scots disproportionately pay into the UK Pension pot, but then don’t get back anything like what they have paid in, if anything at all. Poverty for the Scots and Huge Tax cuts for the Rich. By the way, Alex Salmond: SNP Party Leader, was formerly the Chief Oil Economist at the Royal Bank of Scotland. So I reckon he knows plenty about how to manage Scotland’s Oil and Gas Reserves. The more Cameron, Clegg and Miliband/ Balls lecture and bully the Scots on their visits here the more they add votes for Independence. Their view of Independence is N.I.M. B. Y. Yet, they promote the opposition( Al-Qeada / 7/7 Bombers) in Syria and now the latest in Ukraine( at risk of starting a full scale war with Russia). But if Scotland wants back its Independence then they attack, undermine and threaten its people. And that’s OK is it? When will Cameron have a face to face live debate with Alex Salmond? Is he feart? Some sloppiness in here. Why do you say it’s important for “the currency to hold up”? Which currency? If the dollar rises against the pound, then the oil would be worth even more than £1.5 trillion. So basically, despite the headline, your article suggests that the Scottish Govt statements and assumptions are broadly correct. The only doubt is over oil price but that equally applies to the UK if Scotland stays – and any amount divided by 65 million people is still a lot worse than 90% of the same figure divided by only 5 million. Thanks Channel4 – now if you can actually bring yourself to broadcast that……. What do you mean, “despite the headline”? Ziad, the headline implies that Salmond has “slipped up” on his assertions about oil, that he has made a mistake but the article [pretty much backs up all that he says hence my comment “despite the headline” to the article, What the British media know is that many people only read the headline in passing, not the whole article so they will put an anti-YES headline – perhaps posing a question at a YE assertion – that doesn’t match the article. No one can say the headline was unfair but it is intended to be misleading to the casual observer. Where does Scotland’s wealth go (if it doesn’t stay here in Scotland)? It’s a simple question but not one often asked.Data from the UK Government’s Office for National Statistics demonstrates in simple terms the distribution of personal wealth in the UK. It is clear to see that London and the South are by far the wealthiest parts of the UK. Not just the South East but the South West as well. (Eurostat Regional GDP per capita) shows clearly that, in terms of wealth generation per head, the Scottish central belt generates as much wealth as much of London and the South. Also Scotland’s North East is (perhaps not surprisingly) one of the best performing economic areas in the UK and does infact outstrip London on a per capita bassis. The map of wealthy household distribution shows a clear North/South wealth divide within England itself which many of us knew about, but many will be surprised at just how far south the divide sits. Without over complicating the issue this data when taken will all other wealth and income statistics that look at wealth / income distribution within the UK confirms that wealth is centralised around London. 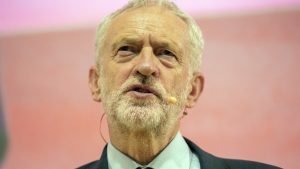 The more northern areas of the UK have suffered years of de-industrialisation, high unemployment and lower investment that followed the emergence of London centric finance and service-led economic policy under consecutive Conservative and New Labour governments. Hi I’m English but lived in Scotland 20 years. Don’t blame for penalising your pension due to lower life expectancy. Scotland’s poor diet increases their annuity payout levels so ‘beat the English’ by being healthy and living longer. I do fear an English backlash. They didn’t stand for the poll tax, they may express their disapproval with Scots splitters by going elsewhere with their money. And they are our closest customers. Why do people not use common sense, Scotland is currently running a bigger % deficit. If independent we will lose ecomomies of scale and although we could direct resources elsewhere to pay for greater public expense there is still too much reliance on oil which is only on a downward trend. Being a renewable giant is also laughable as these are not cost effective without the huge subsidy (which is why I have panels on my roof). Sounds very risky that 300 year of benefits is given up for 30 years of independence, perhaps if Salmond and Sturgeon had children they may think better. I don’t wish mine to be emigrating south. As for stats, why do the SNP not use their most recent figures but harp on about the goodtimes? Perhaps because they show the worrying increase in deficit. Michael, want to quote your source for saying that Scotland has a higher % deficit, because UK Govt figures suggest our deficit is 0.5% less than the UK average (which included London & SE England to boost that average). Also, funny that it is so dangerous for a nation of 5 million to rely on oil but it is fine for 60 million to rely on it – in any case, independent (Standard & Poors) show that without any oil revenue Scotland’s GDP would be just about on the UK average, and the reasons for the recent reduction in oil tax revenues was because the UK Govt gave the oil companies big one-off tax relief for investment in the North Sea. This investment will result in significantly increased production from 2016. Finally, why do you assume that “bigger is better”, this ‘benefit of scale’? That only works if Scotland’s interests and the UK’s interests coincide but in many cases they are exactly opposite. I does not help to have £10 spending power and spend it on something we don’t need or use when we could have £1 spent on the right things. I am afraid that your arguments do not look deeper into the figures for underlying causes and trends and you are rather believing the media hype which only gives you a cursory understanding. I have to say there is arguments for both sides here obviously. The bottom line for me is the majority of the Scottish people have had enough and want change. Change will only come in a YES vote. We see through the British media and frankly regardless of all the spin we will vote YES and democracy will prevail. Scotland’s future is in our “the voters” hands. Regardless of turn out YES holds the upper hand….you only have to live in Scotland to see it! Of course it would be more honest if you put – post by a nat – to prefix your comment ‘steve’. 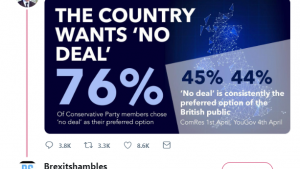 Factually not right im afraid – the two most recent polls show yes slipping back now we have had time to digest the nonsense in the white paper. This will now continue as more and more sensible people see just what a fairy tale Salmond’s vision is. Re oil the new figures produced by Swindley – because he had to admit his Nov figures were fantasy, are still optimistic. Now the last time I set up a business, the idea was to underplay the revenue and weight the costs to avoid any nasty surpirises. Of course the SNP dont care what they promise as if they manged to con enough people by September then they wont have to fulfill any of them – it will be too late then. Most people thankfully are sensible enough to see through his lies. This seems a rather generalised and wild statement. What evidence do you have to support this claim? Wow its amazing to see how many people seem content with level 1 research. Our great land WILL fall if we go along with Salmond. For starters forget the oil most of the revenue will end up in London and The US. And for those who argue that we may end up with more money…you dont think a Scottish goverment will be just as greedy and corrupt as every other one? Luckily there seem to be more sensible than those who want..’change’. They wanted change in germany in the 30s. As an Englishman I support Scottish independence. I presume he divides this up by head of population? so Scotland owns 8.4% of sterling. Scotland has free universities for the Scots this is great. As more money from the public purse is spent per head of population in Scotland, Maybe the money saved will enable this to happen in the rest of the UK. as Scotland will be outside the EU there will be a tax on all produce exported into the EU. I can come to Scotland for my duty frees, just drive across the border and return a couple of hours later. think how many UK illegal immigrants can sneak across the border knowing the UK border force cant touch them there. it all seems a win win for us in England. what I can not understand is why England will never get a choice Like this? Independence for England!!!!! So I hope everyone in Scotland votes yes, good luck to you, at least you have a choice which is more than we in England are ever going to get. because if it were to happen here according to the poles 83% of English people would vote yes to English independence. so Please vote yes to independence and give the English what they can not get for themselves. What have the poles go to do with it ?? Could we not move the borders back to how it was when the romans conquered England, but built a wall (hadirans wall) to keep the scots out. That way the Northeast (Geordies) could be part of scotland and vote yes to independance. What have the scots got in common with the English they cant understand the scottish for a start. The English dont care about scotland your there guinea pigs, council tax, banning smoking in public places, bedroom tax, try it on the scots first see if they complain.